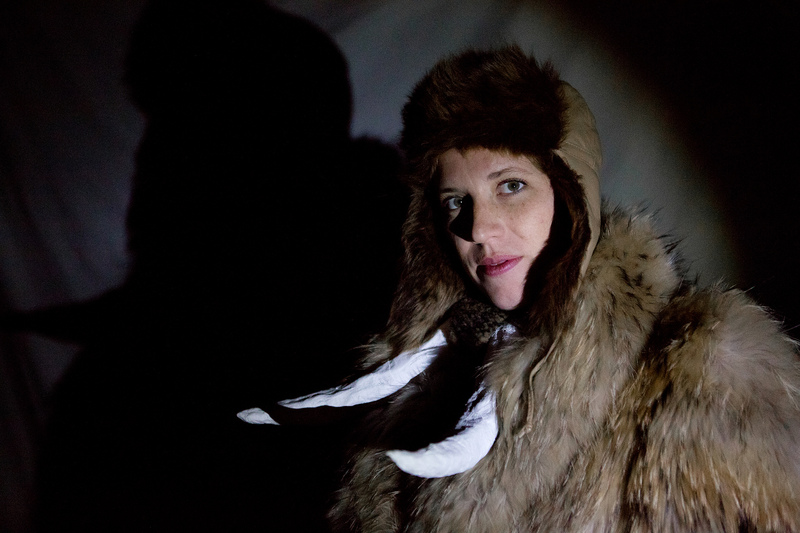 This weekend, Buran Theatre’s production of Mammoth: A De-Extinction Love Story will open at the Brick, where it is being presented as part of their Resident Artists series. Adam R. Burnett is Artistic Director of Buran Theatre and as such his plays are the driving force behind the company. After years of seeing his work and corresponding with him, I consider Adam a friend and always look forward to seeing the next Buran offering. According to the press notes, Mammoth is a meditation on the scientific notion of “de-extinction,” which outlines ways that extinct or endangered species can be brought back to life through modern technology. All it ever really takes for Burnett and Buran is a solid topic like this – something with deep rabbit holes of research to get lost in that immediately suggest highly theatrical scenarios but also echo a very specific human experience. From there Burnett and the affiliated Buran artists curate what amounts to a high-octane sensorial data dump, which doesn’t necessarily seek to tell a story, but communicate the emotional truth of the subject. Quick tangent: there was a funny video recently, put out by The Onion, where an interviewer sits down to interview God. The joke is that it’s set up like a typical Nightline-style prime time interview, but the interviewer’s senses are immediately annihilated by the immensity and majesty of direct communication with a deity. This is very much how seeing a Buran play feels: you are confronted with a very big idea via a collection of evocative language, impeccably designed imagery, zany comedy, catchy music, and frenetic movement designed to overload all the processors in your brain. Sure, you react to each event in the moment, but you only really begin to process aspects of it in the afterglow of the performance, like the way you would suddenly remember a piece of a dream. Buran describes itself on its website as “a rigorous process-based theatre company of disparate artists, flung across the globe, who meet around Burnett’s theatre texts.” It is probably more accurate to refer to Burnett’s work as “texts” as his theatrical pieces tend to have little in common with the traditional idea of a play. Burnett’s work bravely devotes its energy to the development of unforgettable performative happenings, with little regard to (or patience for) linear narrative. Instead, Burnett attacks these big ideas – like loss, wellness, hubris, or the sublime – head on; grasping at threads of thought with the franticness of a child attempting to grab at the strings of a bunch of balloons before they float away. The resulting gestalt experience of a Buran performance is something wholly new, eliciting singular impressions and raw emotions that would have surely been inaccessible to mere words. Prior to reviewing Buran’s Magic Bullets last year, I did a fairly comprehensive piece reflecting on previous Buran shows The House of Fitzcarraldo and NIGHTMARES: a demonstration of the sublime. In re-reading them, I feel like they are still a solid primer for the uninitiated on Buran and hopefully capture a lot of what makes the company so terrific. I am seeing Mammoth next weekend and my proper review will post soon after that.